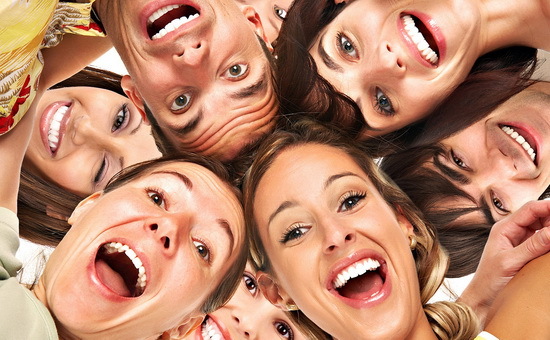 Laughter offers a number of positive organic effects on the human body. Strengthens immune system, reduces cravings and makes people more resistant to pain. Reduces the pressure, stress and increases the flexibility of muscles. Recently laughter has been used as a healing method to assist in the speedy recovery of patients. 15 minutes of laughter every day, can also greatly help the heart and blood vessels. Studies have shown that preschoolers laugh up to 400 times a day. Unfortunately, when people reach adulthood, the frequency of laughter decreases drastically to 17 times on average each day. Humor and laughter can significantly reduce stress and anxiety. Laughter lowers blood stress hormones such as adrenaline, cortisone, epinephrine and dopamine. Promotes the production of health hormones such as endorphins and neurotransmitters. Exercises the diaphragm, abdominal and other body muscles so in addition to other benefits the opportunity for physical exercise helps the heart and the vascular system. Laughter improves the function of the endothelium of arteries. Endothelium is the cell structure that covers the lumen of the vessels and is in contact with the circulating blood. The endothelium plays an important role in the genesis of atherosclerosis. Basically is at the level of endothelial that atherosclerosis is developed leading to the hardening and narrowing of the arteries. Researchers from the University of Maryland conducted tests about the endothelial function of arteries in a group volunteers with an average age of 33 years. The results showed that when the volunteers watched films that made them laugh, the functionality of the endothelium was significantly better. This translates into better blood flow in the arteries. The observed improvement in the functionality of the endothelium after the laughter was similar to that observed after physical exercise. For this reason, researchers believe that laughter has about the same beneficial effect on the heart and arteries such as exercise. The psychological and physical relaxation generated by laughter is well known to all. It can draw your attention away from things that cause anger, guilt, stress and other negative emotions. It allows you to see difficult situations with a new perspective, more like a challenge rather than a threat. At the social level, laughter and humor, creates bonds and better relationships with others. Also, because laughter is contagious, if we introduce into our lives more laughter this means that will help others in our environment to laugh more, which will have positive repercussions on many levels. By improving the mood of those around us laughter and humor reduces not only their own stress levels but also ours. In this way the quality of our relationships is improved with benefits for everyone. Humor, smile and laughter can facilitate communication between employees and managers. They can create a work friendly environment where tasks are carried out effectively. Laughing at work combats stress and promotes the relaxation of employees. The good mood and relaxation promoted by the laughter and good humor can increase efficiency and productivity. It must be stressed however that the jokes and other forms of humor should never offend anyone. So we see that while laughter has many beneficial effects on mental and physical health, the frequency decreases drastically in adulthood compared with childhood. What can we do about it? How can we laugh more often? Watch a good comedy with friends: In cinema, television, theater. The selection of a good comedy can introduce frequent and more laughter in our lives. Laughing is contagious so watching a good comedy when we are with friends, is more enjoyable and creates happy memories. Approach life from a different angle: The way we deal with everyday problems and vicissitudes of life, can be crucial in psychological and physical health. Instead of complaining, is better as much as possible to see them with another angle, with another lens and try to see the humorous side of things. Try to laugh even when there is no real reason: Studies have shown that even when there is no real reason to laugh, the attempt to laugh alone creates positive results. Indeed there are specialists who recommend people to try a fake smile or fake laugh because this can lead to real laughter, with important benefits for their health. Finally, I would say that laughter is an important natural weapon, without any side effects, that nature gave us to improve our mental and physical health. We should not forget that 15 minutes of laughter a day helps keep the heart and body in good health. Get rid of stress in just 5 minutes!